How Many Human Skeletons Are in U.S. Museums? Samuel J. Redman is an Assistant Professor of History at the University of Massachusetts Amherst. He’s the author of the new book, Bone Rooms: From Scientific Racism to Human Prehistory in Museums (Harvard University Press, 2016). Spring tends to bring visitors back to museums. Relatively quiet during the frigid winter months, the exhibits at the Smithsonian in Washington D.C. will soon be bustling with activity again. Hundreds of school groups, tourists by the thousands, and even a smattering of locals will visit the museums for the first time. Unbeknownst to the vast majority of these visitors walking from the National Mall into the Smithsonian is the fact that the museum possesses about 30,000 sets of human remains. Certainly, many are aware that museums like the Smithsonian sometimes exhibit ancient Egyptian mummies. Add to the Smithsonian the Hearst Museum of Anthropology at the University of California, Berkeley – with a collection of about 18,000 skeletons and the substantial collections housed at the American Museum of Natural History in New York, the San Diego Museum of Man in California, and the Field Museum of Natural History in Chicago – and it suddenly becomes clear the human body collections at the Smithsonian’s are no fluke. For a time in the late nineteenth and early twentieth centuries – collectors of all kinds, ranging from professional archaeologists to medical doctors and amateur explorers – shipped boxes containing the bones of the dead to create the largest physical anthropology collections in the world. 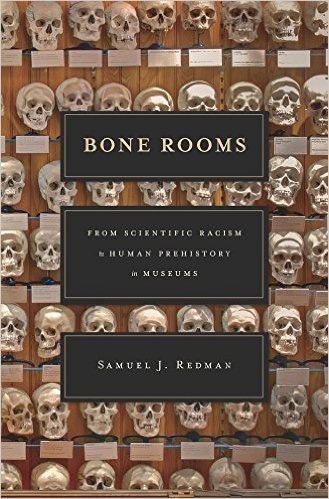 In researching and writing my book Bone Rooms: From Scientific Racism to Human Prehistory in Museums, I explored the history of collecting and exhibiting these bodies in museums both large and small across the United States. For historians, anthropologists, and archaeologists interested in pinning down exactly how many human remains are housed in museums across all of the United States – this has proven to be a surprisingly challenging question to answer. In 1990, a new law, the Native American Graves Protection Act (NAGPRA) mandated that museums receiving any federal funding inventory their skeletal collections, which might potentially fall under the guidelines of the new law. Twenty-five years later, as of October 2015, the National Park Service estimates that 50,518 individuals have been repatriated or returned to tribes from museum collections around the United States. Recent estimates suggest the number of Native American remains held in the collections of U.S. museums number about half a million. Adding to this figure are a smaller (but still significant) number of skeletons from African Americans, European Americans, and indigenous peoples originating from places all around the entire planet. According to a recent survey, over 116,000 sets of Native American human remains and nearly one million burial objects are considered by museum scientists to be culturally unaffiliated, meaning that no specific tribal origin has yet been assigned to these sacred objects. Without affiliation, these bones are technically not eligible for return until a firm cultural connection to living ancestors can be established. While many anthropologists and museum professionals posit that great care must be taken in determining the proper cultural affiliation, others charge this rule has been used as a loophole to guard certain museum collections from repatriation to Native peoples. Compounding an already complex legacy, another half a million Native American skeletons are thought to lie in collections in museums throughout Europe. While some bones collected as trophies ended up in museums, as did the above example, it is also clear that many skulls and other bones continue to languish in the closets and on the fireplace mantles of private collectors throughout the United States and beyond. We owe it to the dead to keep better track of our prolonged efforts to turn them into trophies, scientific specimens, and valuable collectables. These significant wrongs must be addressed. We must also after so many years - finally - fully confront this complex legacy in a more thorough manner, one deserving of our most important cultural institutions.